For the 1956 film, also directed by Cecil B. DeMille, see The Ten Commandments (1956 film). The film is divided into two parts: the Prologue, which consists of the epic tale of Moses, and the Story, set in a modern setting and involving living by the lessons of the commandments. The opening statement explains that modern society mocked and laughed at Judeo-Christian morality until it witnessed the horrors of the World War; it then beseeches the viewer to turn back to the Ten Commandments, stating: "the fundamental principles without which mankind cannot live together. They are not laws—they are the LAW." From there, the Book of Exodus is recounted. At the point of the Ten Commandments, Moses is seen on Mount Sinai, having witnessed the commandments given as writing in the sky, which he then manually carves into stone tablets. When he returns, he finds that the Israelites have fallen into debauchery, having built the golden calf to worship. An Israelite man and woman seducing each other find, to the horror of both, that the woman has hideous sores covering her hands and is now unclean, prompting her to beg Moses to be cleansed. A furious Moses commands the power of God to destroy the calf with lightning and smashes the commandments, deeming the Israelites unworthy. Two brothers, John and Dan McTavish, are under the influence of their mother, a strict believer in the Biblical law (she scolds her sons for dancing on Sunday, for example). The two sons make opposite decisions; John follows his mother's teaching of the Ten Commandments and becomes a carpenter living on meager earnings, and Dan, now an avowed atheist, vows to break every one of them and rise to the top. The film shows his unchecked immorality to be momentarily gainful, but ultimately disastrous. The mother reads the story of Moses and emphasizes strict obedience and fear of God. Dan wins over a beautiful young woman, Mary, with his wealth and freewheeling attitude, although she in fact has unresolved love for John, which John reciprocates even though he respects Dan and Mary's marriage and will not covet. Three years later, Dan has become a corrupt contractor. He earns a contract to build a massive cathedral and decides to cut the amount of cement in the concrete to dangerously low levels, pocketing the money saved and becoming very rich. He puts John, still a bachelor, in charge of construction, hoping to use him as a conduit to provide the gifts to their mother that she refuses to accept from Dan. Dan cheats on Mary with Sally, a Eurasian adulteress. One day, his mother comes to visit him at his work site, but the wall collapses on top of the mother, killing her. In her dying breath, she tells Danny that it is her fault for teaching him to fear God, when she should have taught him love, confessing her strict lawful morality to be flawed in comparison to her son's version. This sends Dan on a downward spiral as he attempts to right his wrongs and clear his conscience, but he only gets into more trouble. To make money, he steals pearls from Sally, who reveals herself to have smuggled herself into the country from Molokai through a contraband jute shipment and is thus infected with leprosy, thus likely infecting Dan as well. In rage, he kills Sally and attempts to flee to Mexico on a motorboat, but rough weather sends him off course and he crashes into a rocky island. His dead body is seen among the wreckage. Mary, fearing herself to also be infected, stops by John's office to say goodbye, but John insists on taking her in. As he reads Mary the New Testament story of Jesus healing the lepers (re-enacted on screen, with Jesus shown only from behind), a light shows Mary's hands not to be scarred at all, and that her perceived scars had disappeared in the light—a metaphor for the healing salvation of Christ. The idea for the film was based upon the winning submission to a contest in which the public suggested ideas for DeMille's next film. The winner was F.C. Nelson of Lansing, Michigan; the first line of his suggestion read: "You cannot break the Ten Commandments—they will break you." Production on the film started on May 21, 1923 and ended on August 16, 1923. There are four people in the modern story of The Ten Commandments, and they view these Commandments in four different ways. There is Mrs. McTavish, the mother, who keeps the Commandments the wrong way. She is narrow. She is bigoted. She is bound with ritual. She is a representative of orthodoxy, yet withal she is a fine, clean, strong woman just like dozens we all know. Dan McTavish knows the Ten Commandments, but defies them. John McTavish is a garden variety of human being, which believes the Ten Commandments as unchanging, immutable laws of the universe. He is not a sissy or a goody-goody, he is a regular fellow, an ideal type of man of high and steadfast principles, who believes the Commandments are as practicable in 1923 as they were in the time of Moses. Still photograph of Theodore Roberts (Moses) and Estelle Taylor (Miriam) in a scene of The Ten Commandments. The Exodus scenes were filmed at the Guadalupe-Nipomo Dunes in northern Santa Barbara County. The film location was originally chosen because its immense sand dunes provided a superficial resemblance to the Egyptian desert. Rumor had it that after the filming was complete, the massive sets – which included four 35-foot-tall (11 m) Pharaoh statues, 21 sphinxes, and gates reaching a height of 110 feet, which were built by a small army of 1,600 workers – were dynamited and buried in the sand. Instead, the wind, rain and sand at the Guadalupe-Nipomo Dunes likely collapsed and buried a large part of the set under the ever-shifting dunes. The statues and sphinxes are in roughly the same place they were during filming. In 2012, archaeologists uncovered the head of one of the prop sphinxes; a 2014 recovery effort showed the body of that sphinx to have deteriorated significantly, but a second better-preserved sphinx was discovered and excavated. The parting of the Red Sea scene was shot in Seal Beach, California. The visual effect of keeping the walls of water apart while the Israelites walked through was accomplished with a slab of Jell-O that was sliced in two and filmed close up as it jiggled. This shot was then combined with live-action footage of Israelites walking into the distance to create the illusion. Portions of the modern story were filmed in San Francisco, with the cathedral building sequence filmed at the then under construction Sts. Peter and Paul Church on Filbert Street and the adjoining Washington Square. Distributed by Paramount Pictures, The Ten Commandments premiered at Grauman's Egyptian Theatre (in Hollywood) on December 4, 1923. On its release, critics praised The Ten Commandments overall; however, the part of the film set in modern times received mixed reviews. Variety, for example, declared the opening scenes alone worth the admission price, but found the remainder of the film disappointing by comparison: "The opening Biblical scenes of The Ten Commandments are irresistible in their assembly, breadth, color and direction [...] They are immense and stupendous, so big the modern tale after that seems puny." It was the second most popular film of 1923 in the United States and Canada. The film's box-office returns held the Paramount revenue record for 25 years until it was broken by other DeMille films. The film competed at the box office with Fox's The Shepherd King, and won out overall. The movie was banned in the 1930s in China under a category of "superstitious films" due to its religious subject matter involving gods and deities. DeMille directed a second, expanded version of the biblical story in 1956. For the later version, DeMille dropped the modern-day storyline in favor of profiling more of Moses' early life. In 2006, the 1923 film was released on DVD as an extra feature on the 50th Anniversary DVD release of the 1956 film. In the DVD commentary with Katherine Orrison included with the 1923 film, she states that DeMille refilmed several sequences nearly shot-for-shot for the new version, and also had set pieces constructed for the later film that were near-duplicates of what he had used in 1923: On March 29, 2011, Paramount released a new Blu-ray Disc with the 6-disc box set. ^ a b Hall, Sheldon (2010). Epics, Spectacles, and Blockbusters: A Hollywood History. Wayne State University Press. p. 163. ^ a b c d e f g h Birchard, Robert S. (2004). "45, The Ten Commandments". Cecil B. DeMille's Hollywood. University Press of Kentucky. ISBN 0-8131-2324-0. ^ a b "The Ten Commandments". Variety. LXXIII (6): 26. December 27, 1923. Retrieved 2014-12-08. ^ a b "He Himself Was "Colossal"". The Montreal Gazette. January 22, 1959. Retrieved 2014-04-28. ^ Gidman, Jenn (October 16, 2014). "Archaeologists Uncover Giant Sphinx in California Dunes". USA Today. Retrieved 2014-12-08. ^ Branson-Potts, Hailey (October 17, 2014). "Sphinx unearthed from 1923 Cecil B. DeMille movie set". Los Angeles Times. Retrieved 2014-12-08. ^ Strawther, Larry (2014). Seal Beach: A Brief History. The History Press. p. 92. ISBN 978-1-62585-035-5. ^ "All About Special Effects – Trivia Quiz (Answers)". NovaOnline. PBS. Retrieved 2009-01-02. ^ Brier, Bob (2013). Egyptomania: Our Three Thousand Year Obsession with the Land of the Pharaohs. Palgrave Macmillan. p. 191. ISBN 978-1-137-40146-5. ^ Brown, Gene (1995). Movie Time: A Chronology of Hollywood and the Movie Industry. New York: Macmillan. p. 68. ISBN 0-02-860429-6. ^ "The Ten Commandments". Silent Era. Retrieved 2014-12-08. ^ Higashi, Sumiko (1994). Cecil B. DeMille and American Culture: The Silent Era. University of California Press. p. 191. ISBN 978-0-520-91481-0. ^ Yingjin, Zhang (1999). Cinema and Urban Culture in Shanghai, 1922–1943. Stanford University Press. p. 190. ISBN 9780804735728. OCLC 40230511. 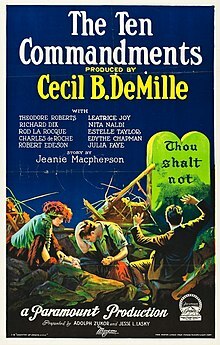 Wikimedia Commons has media related to The Ten Commandments (1923 film). This page was last edited on 5 April 2019, at 03:01 (UTC).